Thanks for spending the time to create this tool and make it available for free. It’s been very useful and a big time saver for me in some ways. This isn’t a bug report. I think the following information may be of help to others. I’ve been using your tool on a Ubuntu 13.10 (2GB RAM, 40 GB SSD) server at DigitalOcean with XFCE 4.10 (currently with, but with and without the XFCE 4.12 PPA updates). I have a ton of things running on this machine including Apache, Tomcat, Railo, PHP, MySQL, iRedMail and more. I’ve tried the –justdoit option and was able to connect to the server using both VNC and RDP sessions. I’ve spent a considerable amount of time trying different desktop environments, configurations, options, suppressing warnings and error messages in ~/.xsession-errors, etc. I was never able to successfully reconnect to an existing session with this setup even using the exact same RDP config for each attempt (same resolution, etc.). Each time I logged in it would be a new session and I would have to kill the processes from old sessions. Also, I was never able to successfully log out from a session, restart or power off the server using the XFCE4 menu options despite having thoroughly configured PolicyKit. 854 for the size of the x11rdp package didn’t look right after seeing the size of that package after a regular build, but I decided to try an RDP connection from a Windows 7 (Pro 64-bit) machine anyway. 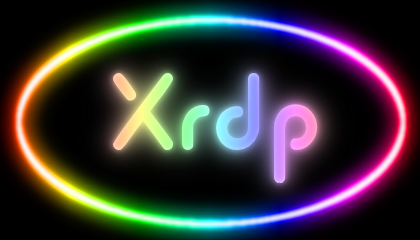 I was quickly greeted by a newer (better looking, IMO) version of the XRDP login window, but the sesman-X11rdp connection type I had been using most often didn’t work any longer and I didn’t see an error message in any logs indicating the exact reason for the failure. I also had vnc4server running, so I tried the sesman-Xvnc connection. On this attempt I logged in successfully. I was pleasantly surprised to find that using this setup I was able to reconnect to existing sessions. I was also able to log out, reboot and shutdown the server using the regular XFCE “Log Out” GUI menu options. This was a big improvement. So, I installed the new package (dpkg -i x11rdp_0.7.0-1_amd64.deb) and rebooted the server. My next attempt logging in to the server using sesman-X11rdp was successful. WOO-HOO! I am now able to reconnect to an existing session and also logout from XFCE4’s “Log Out” menu (using both sesman-X11rdp and sesman-Xvnc) as one would expect from an RDP connection. I would also like to note that Microsoft recently recently released updates for the Remote Desktop Connection program (at least for Windows 7 Pro. 64-bit) and I can’t confirm or deny whether or not those updates played any role in my recent successes. I hope this information helps at least one other person. KTB – thank you very much for the feedback! Thanks for the script. I can confirm that this does not work on Netrunner 13.12. I was certain it was deb/Ubuntu build. It will finish and configure, and I set. But when logging into XRDP from Windows, it immediately disconnects. Running apt-get install xrdp installs it like it was not on there to begin with. I’ll bung it in a VM and see what o-matic makes of it.